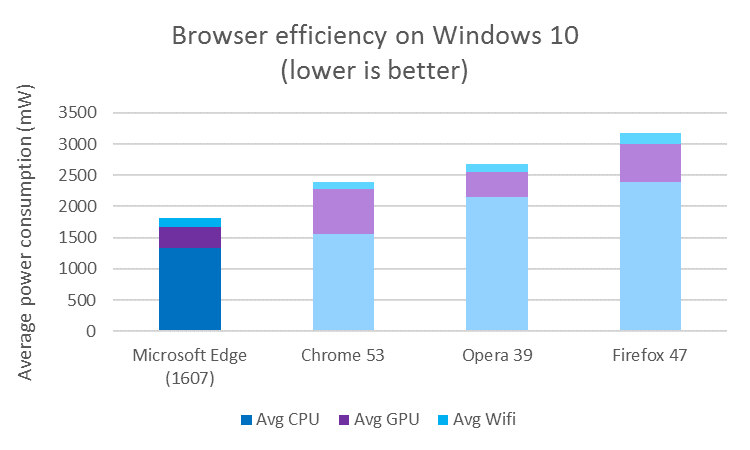 Chrome may have improved, but Edge still lasts longer according to Microsoft. Microsoft says its browser uses less power, lasts longer. Microsoft rolled out a series of tests earlier this year to demonstrate that its brand-new Edge browser is more energy-efficient and faster than rivals Google Chrome, Mozilla Firefox, and Opera, and the company is now conducting the same benchmark once again after a recent update that Google made to its own browser. Specifically, the recently-released Google Chrome 53 comes not only with material design but also with significant speed improvements, and the search giant claims that its new browser is much faster than a one-year-old version. And because Google praised the performance of its browser, Microsoft decided to conduct a new series of tests to determine the most battery-efficient app at the moment. “We’re thrilled to see improvements across the board, but the trend may look familiar! Microsoft Edge remains the most efficient browser on Windows 10, offering 24%-43% more efficiency across a sample of typical activities including video playback, multi-tab productivity, shopping, social media, and more,” Microsoft said after this new series of tests performed on the same devices running Windows 10 Anniversary Update. According to Arstechnica, In June, Microsoft started to make aggressive claims about the battery life of its Edge browser, especially in streaming media scenarios. Opera fought back, claiming that its battery saver mode pushed it ahead of Microsoft’s browser. With the release of Chrome 53, Google is claimingsubstantial improvements in battery life, too. Microsoft isn’t willing to drop the battery life issue, however, and the company has published new scores that show the latest version of Edge in the Windows 10 Anniversary Update maintains a considerable advantage, at least in the company’s Netflix-based streaming media test. Playing a video repeatedly, Edge lasted 527 minutes, compared to 429 minutes in Opera with battery saver, 365 in Chrome 53, and a measly 312 in Firefox 48. The testing also suggested that the Windows 10 Anniversary Update itself may be helping computers use less power. The difference wasn’t great, but Opera 39 on the Anniversary Update beat Opera 38 on the 2015 Fall Update, suggesting that the operating system is being more frugal. In a second test that measures energy usage in the CPU, GPU, and Wi-Fi chip during some simple browsing scenarios, Microsoft again claims that Edge is more energy-efficient than its competition.